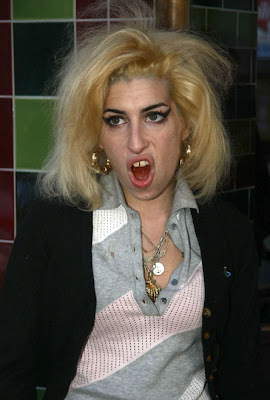 The 50th Annual Grammy Awards are tonight and our girl, Amy Winehouse, is nominated for 6 awards. Initially, Amy was turned down for a US visa by the embassy in London, but then Washington approved her visa for the performance. Visa issues aside, she will perform live via satellite tonight. She is out of rehab now, or in rehab, but we do know that after a video surfaced of her smoking crack and/or heroin, she quickly entered rehab. Her husband, Blake, is still in jail, and we're grateful that Amy got over that ridiculous desire to be blonde. We were scared for a second.